TAMPA With less than a year to go on construction of the first phase of the Tampa International Airport expansion, we are moving forward with the next phase: a curbside expansion with express lanes for travelers with no checked bags and a 17-acre real estate development. Our third and final phase, proposed for some time after 2020, will be a 16-gate airside. TAMPA BAY, Fla., April 28, 2017 /PRNewswire-USNewswire/-- What if there was a day, once a year, when Tampa Bay residents could rally behind local community foundations to support their favorite charity? 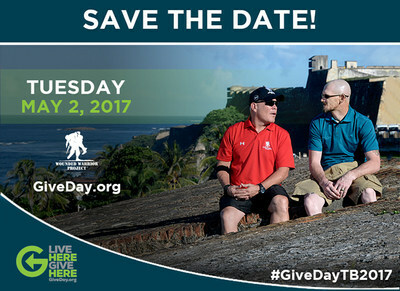 There is – and on May 2, "Give Day" returns to Tampa Bay for its fourth year. Wounded Warrior Project® (WWP) will be among the nonprofits registered to participate in the 24-hour online giving challenge, which is hosted by the Community Foundation of Tampa Bay. "In many ways, the communities where our warriors live and work can have a significant lasting impact on their recovery," said Gary Corless, WWP chief development officer. "Community members interact with these injured veterans daily and see their needs. That gives them a chance to understand some of the challenges warriors face when returning to civilian life, but also where they can support those Wounded Warrior Project serves. Events like Give Day Tampa Bay can make all the difference; we're extremely grateful for the past generosity of the Tampa Bay community. We're excited for this year's event, with the community once again helping fuel Wounded Warrior Project's mission to honor and empower Wounded Warriors." To learn more about Give Day Tampa Bay, visit givedaytampabay.razoo.com/story/Wwp. And to see how donors support the programs and services that are connecting, serving, and empowering WWP's wounded warriors, visit http://newsroom.woundedwarriorproject.org/. Wounded Warrior Project® (WWP) connects, serves, and empowers wounded warriors. LUTZ — Tom Ryan, economic development manager for the Pasco Economic Development Council, says he gets asked a common question from executives pondering a company relocation to Pasco. (WFLA) — Tampa Bay area home prices surged more than 14 percent in December, according to Florida Realtors. That’s the biggest year-over-year gain of any major metro area in Florida. 2017 is also projected to be a strong year for home sales. TAMPA Home prices surged 14.4 percent in December for the biggest year-over-year gain of any major metro area in Florida. TAMPA Home prices continued to soar in October, with Hillsborough County recording its biggest year-over-year gain since January. Pinellas, Pasco and Hernando counties also showed dramatic increases as buyers vied for an exceedingly tight supply of single-family homes — Pasco had less than a three-month inventory. And even though interest rates have risen slightly since the presidential election, there is little sign the market is slowing down. "We haven't noticed any impact yet,'' said Rachel Sartain, managing broker at Keller Williams Realty St. Petersburg. In fact, she said, the possibility of rates going higher will "hopefully increase activity'' by spurring people to buy now. Pasco had the biggest jump in single-family home prices, up 17.4 percent from October a year ago to $179,900. Hillsborough, meanwhile, had its biggest gain in nine months, up nearly 16 percent to a median of $220,000. In Pinellas, prices rose nearly 15 percent, to $206,500, and in Hernando, they were up nearly 13 percent, to $141,500. With demand still high — and prices to match — near downtown St. Petersburg, Sartain said more buyers are looking farther north, in the 33702 and 33703 ZIP Code areas, where houses are more affordable. Related: How long can the good times roll for Tampa Bay's housing market for the bubble pops? At the other end of the spectrum, the top price paid in October for a bay area home — and the most paid for any single-family house in three years — was $6.875 million for a six-bedroom contemporary estate in Safety Harbor overlooking Old Tampa Bay. Although the 10 gated acres were bought in the name of a trust, the borrowers on the $4 million mortgage loan are Pers and Svetlana Wickstrom. He is CEO of several drug and alcohol rehabilitation in programs in Michigan, including the 200-bed Best Drug Rehabilitation. In Hillsborough, October's priciest transaction was a 5,000-square foot waterfront house in Tampa's Sunset Park area that sold for $2.857 million. The Coldwell Banker listing agents, Mike Hughes and Jeff Shelton, were the selling agents on two other mega-deals in Tampa this year — the $6.625 million sale of former Tampa Bay Buccaneer Coach Greg Schiano's home and the $4.5 million sale of a house purchased as a tear-down. Meanwhile, Hughes said, the demand for homes under $500,000 has been "extremely active,'' especially from buyers who plan to raze and build new. In Pasco's Trinity area, the Champions Club golf course community continued to be popular, with a home there selling for $912,532 in October's priciest transaction. And in Hernando, a mansion on 20-plus acres in Brooksville sold for $825,000. The median time from listing to contract dropped in all four counties — just 29 days in Pinellas, 31 days in Pasco, 34 days in Hillsborough and 42 days in Hernando. Sellers in Hillsborough County received 97.3 percent of their asking price; in the other three counties they got 96 percent. Prices of condos and townhomes showed year-over-year increases, up 16.4 percent in Pinellas to $145,000 and up 13.4 percent in Hillsborough to $144,000. For Florida as a whole, the median price of a single family home in October rose 11.7 percent to $220,000 while the price of a condo or townhome was up 8 percent to $161,000. "Florida's housing market continues to experience fewer sales of distressed properties and a restricted supply of homes for sale," said Matey Veissi, president of Florida Realtors. "When you look at the state's tight inventory of homes and a decline in the median time it takes for a home to sell, it shows buyers are still in the market. However, they're not finding as many potential options as they'd like." TAMPA — In the years to come, downtown Tampa streets will be lined with retail storefronts. The city will have at least two grocery stores, more than a half-dozen parks and will be home to two more urban hotels. KEEPING CURRENT MATTERS: It’s that time of year; the seasons are changing and with them come thoughts of the upcoming holidays, family get-togethers, and planning for a new year. Those who are on the fence about whether or not now is the right time to buy don’t have to look much further to find four great reasons to consider buying a home now, instead of waiting. TAMPA TIMES - Orlando and Tampa pulled the equivalent of a gold and silver in financial planner website WalletHub's annual ranking for the best places in the country to retire. Orlando ranked tops among 150 metros ranked and Tampa was second, with both aided by the combination of a less expensive cost of living and a wide range of recreational offerings. Florida fared well overall, notching four of the top seven spots. In addition to Tampa and Orlando, Miami ranked fourth and Cape Coral seventh. St. Petersburg ranked 21st. WalletHub's analysts compared affordability, quality of life, health care and availability of recreational activities. Its 31 key metrics ranged from "cost of living" to "public-hospital rankings" to "percentage of the 65 and older population." The best marks for Tampa came in affordability (No. 3), activities (No. 17) and quality of life (No. 18) while Orlando's top scores were in activities (No. 6), affordability (No. 7) and health care (No. 11). IRVINE, CA - ATTOM Data Solutions (the new parent company of RealtyTrac), the nation's leading source for comprehensive housing data, today released its June and Q2 2016 U.S. Home Sales Report, which shows that single family homes and condos sold for a median price of $231,000 in June 2016, up 6 percent from the previous month and up 9 percent from a year ago to a new all-time high -- 1 percent above the previous peak of $228,000 in July 2005.